Adapted from a reflection written on January 20, 2008, and explored last September. Today we explore again how scripture’s wisdom might help us discern the difference between true and false shepherds. Yesterday we explore the concept of the shepherd in Old Testament scriptures. Today we look at the books of wisdom to see what wisdom they hold for us as we look for a way to discern the difference between true and false shepherds. In the Book of Psalms, the Holy Spirit brings us beautiful words of the comforting, guiding, protecting shepherd. Psalm 23 describes the divine shepherd. Psalm 28 asks Yahweh to be our refuge and protection. Psalm 78 describes the relationship we want to have with the good shepherd. Psalm 80 asks the shepherd for restoration. In the sapiential book of Ecclesiastes, Chapter 12, we hear that the words of wisdom are like the shepherd’s staff. When we compare translations of these verses, we discover the qualities of the good shepherd. In hope we cleave to the shepherd who guides, who calms our fears, who gathers us in. Tomorrow, prophets who shepherd us . 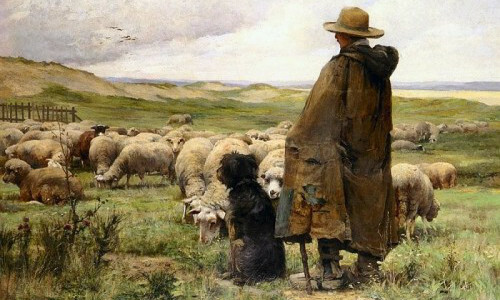 . .
For more beautiful images of shepherds and their flocks, click on the image or visit the “Tending the Flock” post on the “Herding on the Web” blog. Jesus tells us that the Creator remains with us in the form of the Spirit. Jesus tells us that the Spirit abides in us through all our suffering and all our joy. Jesus tells us that although he is no longer visible to us in his original form, he is still with us through the hands and feet, words and healing of others. Jesus tells us that the Creator’s wisdom resides in us in the form of God’s Spirit. Jesus tells us that we have an advocate who brings healing and restoration, we have an advocate who promises justice and mercy, we have an advocate we can trust. Let us share this good news today in the way we live and love. When we compare varying translations of these verses, we find that we have an advocate we can trust, the healing, transformative presence of God. The prophet Zephaniah wrote sometime between the years of 635 to 630 B.C.E. His is a brief prophecy and its message is succinct: there is a day if universal judgment which will arrive surely . . . and this judgment will be followed by restoration. Earlier in this chapter he refers to the town of Cush saying that beyond the rivers of this town the scattered peoples will bring offerings. 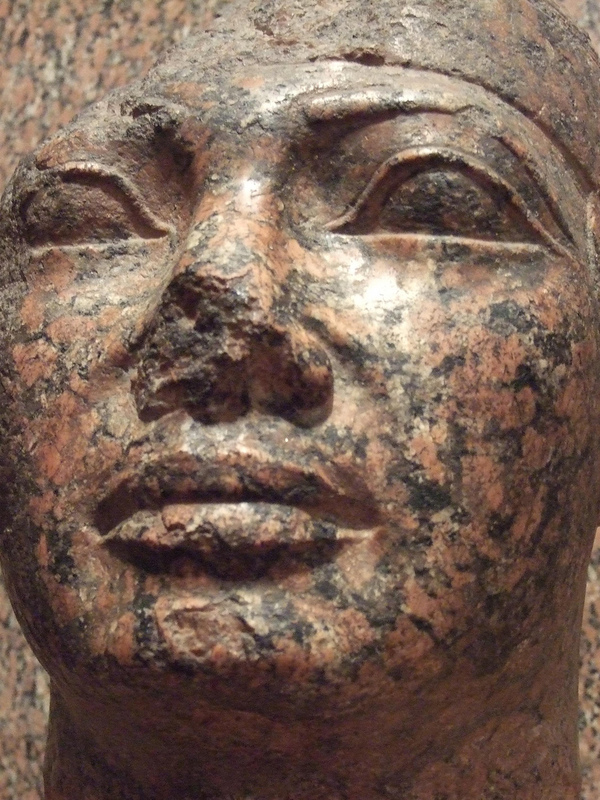 Cush was located south of the upper cataracts of the Nile in the area referred to as Nubia. It was a land of great wealth with commerce routes which brought to the Mediterranean materials such as gold and silver, cosmetics, balsam, incense, myrrh, ostrich eggs, and other wild animal products. Jeremiah also refers to this place as a source of topaz. Further, these people were from to time a powerful political force: the Nubian pharaoh Shebitku defeats the Assyrian Sennacherib in Israel in 701 B.C.E. – an astounding account recorded in 2 Kings. (Zondervan 1519.) Their power, however, seems to have collapsed after 671 B.C.E. What does all of this signify? The restoration this prophet foretells is universal. It will be bestowed on even those who have been scattered as far off as Cush – even those who have been held captive by her alluring power and cosmopolitan life. Sing, O Daughter Zion; shout aloud, O Israel! Be glad and rejoice with all your heart, O Daughter of Jerusalem! . . . I will give you honor and praise among all the people of the earth when I restore your fortunes before your eyes. A Favorite from November 23, 2007. Written on October 19, 2010. We can never hear enough the good news that we are restored. This is what Jesus comes to tell us, this is the work of Christ who comes to revive, resuscitate, revalidate . . . and restore. And we notice in today’s Noontime that the rewards received by Job after he struggles through the darkness are twice what he had before his trials began. Today’s Gospel (Luke 12:35-38) is about girding our loins, lighting our lamps, and being like ready servants who await the return of the master. When studying the Book of Revelation in our parish study group, we discovered that while the second coming is an event that most of us see in the distant future, it is truly something that is taking place now. And we must prepare for it. Luke tells us: Blessed are those servants whom the master finds vigilant on his arrival. We see that: The master is already among us and we must act and speak as if we believe he is present. Luke tells us: [The master] will gird himself, have [the servants] recline at table, and proceed to wait on them. We see that: The master has arrived and we must put aside our own agendas to allow him to wait on us as he sees best. Luke tells us: And should he come in the second or third watch and find them prepared in this way, blessed are those servants. We see that: The master is already waiting upon us, even though we may feel that he is past arriving. And what the master brings is restoration and an ample reward for those who stay and watch with him. Job’s story is famous because through no fault of his own he loses all that he has; and this is a story that many of us live. Our story is equally famous because as the faithful who tend our lamps, who prepare for the master, and who wait through the suffering and pain . . . we too, will be rewarded double-fold. And no matter the amount of days we accumulate here on earth, we too, will live a life full of years.